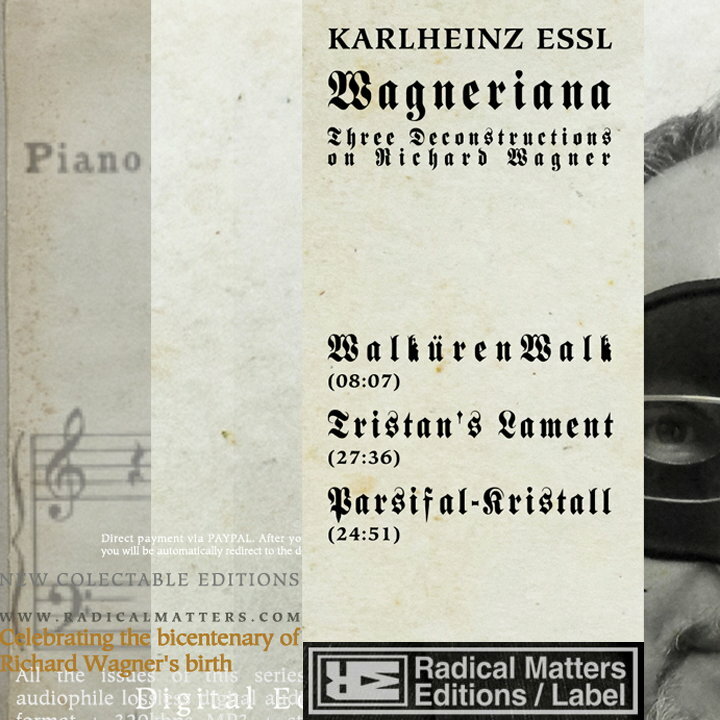 Karlheinz Essl's decision to title his release Wagneriana - Three Deconstructions on Richard Wagner opens up a number of associations it otherwise might not have had he opted for the simpler Wagneriana. The longer title obviously encourages the listener to broach the recording with deconstruction-related ideas in mind, many of them (such as différence and dissemination) relating, of course, to Jacques Derrida. In that regard, the Essl work can be viewed as an examination of notions of authorship and the ways by which Wagner's music can be wrested from its creator's grasp, and of how the meanings he imputed to the material are supplemented by a proliferation of additional meanings that others, such as Essl, bring to it. But not only is his recording a literal deconstruction of Wagner's music, it's also an exercise in defamiliarization, a means by which the listener can be stirred from a conventional, reflexive reception of Wagner's work to confront it anew. A few words about Essl before proceeding. Vienna-born, he's an Austrian composer and double bassist who studied composition with Friedrich Cerha and completed his musicology studies with a doctoral thesis on Anton Webern. He spent time at the Darmstadt Summer School (1990-94) and at IRCAM in Paris (1991-93) and is currently a professor of composition and electro-acoustic music at the University of Music and Performing Arts in Vienna. The recording itself features three works, one short and two long, and all of drastically different character. More critically, all—the first two especially—lead the listener sufficiently familiar with Wagner's music into a re-examination of the composer's work. At the risk of overstatement, one might argue that repeated exposure to Wagneriana - Three Deconstructions on Richard Wagner could result in the listener never hearing the composer's operas in the same way again. The title Tristan's Lament leaves little doubt as to its source (Tristan und Isolde), though anyone familiar with the opera's famous “Prelude” and “Liebestod” would be able to identify the source material. The piece plays as if Essl purposefully wanted to push the opera's then-challenge to conventional harmony and tonality to another level, in this case through a dramatic application of pitch-shifting. Wagner's material is heard as if in a state of drunken wooziness; throughout the twenty-eight minute piece, those well-known attempts to reach the heights of glorious climax are thwarted, and moments of temporary ascent are undercut when the pitch plummets downward. Here especially is where Brechtian alienation comes into play, given that the listener's customary surrender to the music's romantic passages is undercut by Essl's pitch-shifting. Of the recording's pieces, it's the twenty-five-minute Parsifal-Kristall that's the one least noticeably altered; in this case, choral voices and orchestral forces seem to operate as per normal, though (unless I'm simply imagining it) subtle reshaping by Essl is audible in the music's drift and waver. Essl's recording is a natural analogue to what Deutsche Grammophon has done in its ReConfigured series by having electronic music producers such as Matthew Herbert, Carl Craig, and Moritz Von Oswald boldly reimagine a classical work (Mahler's unfinished 10th Symphony in Herbert's case, for example). Regardless, Essl's makes good on its Wagneriana - Three Deconstructions on Richard Wagner title by adding to the storehouse of meanings that have accrued since the composer's works came into being.